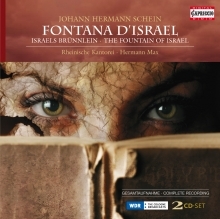 By the time Johann Hermann Schein, cantor at St. Thomas, Leipzig, put his signature to the preface to his new collection of religious vocal compositions entitled FONTANA D’ISRAEL, (The Fountain of Israel, Selected Edifying Quotations from the Old and New Testaments) dedicated to the Council of Leipzig, he was already able to look back on a considerable and varied compositional œuvre. But it was the only one of Schein’s religious works to be reissued as long as twenty-two years after his death, and it is still regarded as an "exceptional" artistic achievement, placing Schein among the leading early-Baroque German composers, alongside Michael Praetorius and Heinrich Schütz. 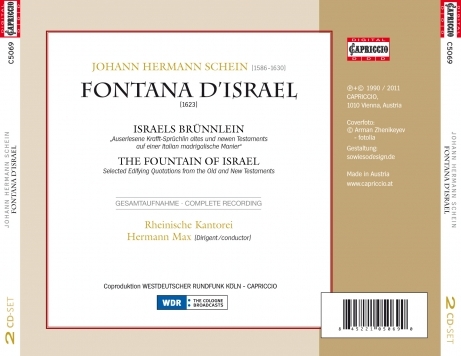 The Israelsbrünnlein contains twenty-six vocal compositions, which, as Schein writes, „can be comfortably played on their own with lively voice and instruments, and also on the organ/harpsichord“ and to which he had added a figured bass, admittedly dispensible in most cases.